In today’s market, there is a huge variety of not only cameras but brands to choose from. With technology continually improving, it’s very easy for today’s latest and greatest camera to quickly become outdated before you even know what’s happened. Buying a camera can be quite the investment, so you want to make sure you purchase a quality camera that will withstand the test of time. What is the Panasonic ZS100? So, what features and characteristics are necessary in a camera to do just that? Newer technology is making cameras increasingly user-friendly, as well as offering photographers more autonomy and imaging control. Let’s see if the Panasonic Lumix DMC-ZS100 has what it takes to be a good camera today and if we think it will hold up tomorrow. Launched in 2016, the Panasonic ZS100 is a compact camera that is ideal for bringing with you when you’re on the go and traveling. Its small nature makes it perfect for slipping into a pocket. Along the vacation line, the Panasonic ZS100 is supposed to be perfect for capturing the sights. It offers both a long-range wide view paired alongside a high optical zoom, so you can capture breathtaking images of landscapes and buildings, or hone in on a key feature for a more intimate shot. While marketed as an easy-to-use camera for anyone, the Panasonic ZS100 has a lot of features that will excite the mid-level photographer. For starters, like other high-quality Panasonic cameras, it offers 4K photo and video modes that capture everything in a succession of quick bursts at a high frame rate per second. Like most digital cameras nowadays, this Panasonic model has a 3’’ fixed type LCD screen. It is a touchscreen, furthering its convenience. To work in tandem with this, the Panasonic ZS100 comes equipped with a live electronic viewfinder, a feature that almost seems essential to a digital camera in today’s age but that many still lack. This feature is ideal for use on a bright, sunny day when it may be difficult to make out the image on an LCD screen. The Panasonic’s viewfinder allows you to clearly see and frame your image, and it automatically turns on when the camera senses you lifting it to your eye. As touched on above, the Panasonic ZS100 offers awesome 4K shooting imaging capabilities for both photos and video. Trying to get that perfect action shot? The 4K mode on the Panasonic ZS100 is ideal for this situation. Capturing at a continuous shooting rate of 30 frames per second (fps), you can go through each frame and select the best image from the bunch. This ensures that you’ll get that shot at the height of the action in a clear, high-quality format, free from blurring. In terms of video, this feature offers 4K live cropping. This allows you to move the recording frame without moving the camera, enabling higher stability. This is ideal for panning in and out and zooming on an object that does not have to be at the camera’s center. In terms of zoom features, the Panasonic ZS100 offers an optical zoom of 10x, perfect for getting a close-up view. This camera also boasts some great autofocus features. 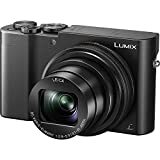 By pairing its Depth From Defocus tech with its autofocus capabilities, the Panasonic ZS100 is ideal for capturing quick and clear images of moving objects. The Depth From Defocus feature allows for the camera to quickly determine the distance between two objects and bring the focus of the shot into sharp focus, as well as allowing for high stability while shooting video. The autofocus features also extend to low-light conditions, even offering a starlight autofocus mode perfect for taking pictures of the night sky. The Panasonic ZS100 has a 1-inch 20.1-megapixel (MP) MOS sensor, ideal for capturing images both day and night. This Panasonic camera is truly great for the editing capabilities it allows your images in post-production. One of the coolest features it has to offer along this line is its Post Focus function. This allows you to go back later to a picture you have already captured and adjust the focus. All you need do is select where you want an increased amount of focus, and it will bring it into sharp relief. The camera also allows you to capture images in RAW format and then edit develop them while still inside the camera. You can apply a variety of color settings, contrast control, noise reduction, sharpness, and more. By using the light composition feature, you can achieve stunning pictures of fireworks and other bright displays. The light composition works by synthesizing the burst of images taken and choosing the brightest pixels from each to form one breathtaking image. The camera has a mechanical shutter speed of 1/2,000 sec, or an electronic shutter speed of 1/16,000 sec. This Panasonic model weighs approximately 312 g, including its battery and SD card. All in all, this is a pretty light camera, especially compared to bulkier types such as DSLRs. This is, however, a bit on the heavy end compared to other compact cameras that usually range somewhere in the 200s. In terms of dimensions, the camera is 4.35 x 2.54 x 1.74 inch in terms of width x height x depth. The Panasonic ZS100 has a battery life of 300 shots per charge, a fairly decent charge length for a camera of its type. It is easily chargeable through use of a USB cord. Overall, users of the Panasonic ZS100 seem to generally like it. They particularly enjoy its portability, 4K modes, and post-production options available inside the camera. Professional photographers have complained that its imaging capabilities are limited by its lens, which isn’t as high of quality as other Panasonic cameras that allow for interchangeable options. They also cite the autofocus sometimes focusing on the wrong point in the shot. There have also been a few complaints of any refunds being slow-coming. You can currently find the Panasonic ZS100 on the Panasonic website for $, $ off its original price. It is also available on Amazon for just a few dollars less, coming in at $. It is an Amazon’s Choice product. Now that we’ve gone over all the product specifications for the Panasonic ZS100, how does it compare to other cameras of a similar nature and price range? Below, we’ve compared the Panasonic ZS100 directly to the Fujifilm X70 and Canon G7 X to find out. Before we get into the side-by-side comparisons, though, let’s take a quick look at how some of the Panasonic ZS100’s features rank. The Canon G7 X is another large sensor compact camera. Both the Canon G7 X and Panasonic ZS100 have 20 MP sensors, though they differ in size and type. They both have the same ISO range of 125 – 12800, though the Panasonic can extend to 80-25600. The cameras each have a 3’’ LCD screen and built-in wireless features. Each camera also offers Optical Image Stabilization. The Canon G7 X is available for $, just a few dollars less than the Panasonic ZS100. There are several reasons to choose the Canon G7 X over the Panasonic ZS100. To start, the Canon G7 X offers superior wide focal length, in addition to likewise superior wide and long-range max aperture. In terms of imaging, the Canon camera offers a slightly better color depth (23.0 vs 22.8) and dynamic range (12.7 vs 12.5). The Canon G7 X also comes with a built-in ND filter that the Panasonic ZS100 does not have, allowing for the use of large aperture even under strong light. In terms of convenience, the Canon camera offers NFC connectivity, an articulating screen for more camera views, and weighs 8 g lighter. While there are several reasons to choose the Canon G7 X, there are even more to choose the Panasonic ZS100. The major advantages that the Panasonic camera has to boast of are its electronic viewfinder, 4K photo mode, and post focus mode. It also offers a greater number of focal points (49 vs 31), higher max shutter speed (1/16000s vs 1/2000s), and better continuous shooting rate (30.0fps vs 6.5fps). Along with its superior optical zoom range (10x vs 4.2x), the Panasonic also has a better long-range focal length. The Panasonic ZS100 likewise has better video resolution quality (3840 x 2160 vs 1920 x 1080) and low light ISO (559 vs 556). Lastly, the Panasonic ZS100 offers superior battery length: 300 shots per charge versus the Canon G7 X’s meager 210 shots per charge. Now that we’ve taken a close look at just how the Panasonic ZS100 compares to the competition, let’s make a quick recap of all the pros and cons of this little camera so you can make the most informed decision possible. In terms of pros, we’d have to say that we most like this camera’s electronic viewfinder, 4K photo and video modes, and its post-production features, such as it post focus mode. The camera’s touchscreen also gives it a leg up on some of its competitors. Its optical zoom of 10x is another great feature that this camera has to offer, along with its image stabilization features. As far as cons go, we wish that this camera had an adjustable LCD screen like the Canon G7 X and Fujifilm X70 so it could provide a wider range of motion and picture-taking capabilities. We also wish that this camera had more external capabilities, such as a hot shoe or mic port, or maybe a different lens since that has received some minor criticism. Overall, the Panasonic ZS100 is a pretty good little compact camera for its value. Its automatic modes make it easy for taking quick pictures and editing them later, which is great for inexperienced photographers who might need a little time to figure everything out. It’s also great for the experienced photographer because of all the different modes and editing capabilities it offers. All in all, this is a pretty decent camera for what it’s worth and is likely to withstand the test of time for a few years yet. Panasonic ZS100 is a pretty good little compact camera for its value. It has a electronic viewfinder, 4K photo and video modes, and its post-production features, such as it post focus mode. However, the ZS100 does have no hot shoe or mic port.